The best source of omega 3’s that come to mind for most is fish. That’s not an option for vegans, or most vegetarians, so it’s important to know which plant-based foods contain essential omega 3 and 6 fatty acids. I’ll give you a brief background on why these types of polyunsaturated fatty acids are important to get in your diet, and then I’ve compiled a list of all the vegan foods with significant amounts of each omega nutrient. All omega 3 and 6 fatty acids are polyunsaturated, meaning that they have more than one bond that is not saturated with carbon molecules. They’re are several types of omega 3s and 6s. Different foods contain different types, and I’ll mention a few important specifics later on. So, why are omega fatty acids important? Omega 3 (essential) – Lowers multiple inflammation blood markers, which improve heart, brain, and eye health, no matter your age. An omega 3 deficiency can also cause fatigue. ALA (alpha-linolenic acid) cannot be manufactured by your body (making it essential), but it also not so useful right away. It needs to be converted to EPA and DHA (both types of omega 3s) to be useful. Omega 6 (essential) – Some types of omega 6s have anti-inflammatory effects, but most are pro-inflammatory (a bad thing). Most people get way too much omega 6 fatty acids from their diet, so usually you want to avoid these, not get more of them. Omega 9 (non-essential) – These can be produced by the body if needed, and you generally don’t need to pay any special attention to getting them from your diet. One last thing to mention is that research has shown that the amount of omega 3s and 6s isn’t necessarily the most important thing for health. Instead, the crucial element is the ratio between omega 3 fats and omega 6 fats. Long story short, most research has found that you want a ratio between 1:1 and 1:4 of omega 3:omega 6 fats. In order for the numbers in the next sections to make sense, you should have a ballpark idea of how much of each fat types you should be looking to consume. As I mentioned, the most important thing is the ratio between omega 3s and 6s. Most nutritional agencies don’t have recommended amounts for these types of fats (especially omega 9s, which are non-essential). The National Institute of Health recommends consuming between 1.1-1.6 grams of omega 3s per day for adults. This is in terms of ALA, which then will be converted to DHA and EPA. In 2002, The Food and Nutrition Board of the U.S. Institute of Medicine recommended consuming between 11 and 17 grams of omega 6s per day for adults. That’s obviously not the correct ratio, and this is pretty out of date, so I’d recommend to ignore this, and focus on your omega 3 intake. Almost all vegan omega 3 sources consist of ALA. Note that algae has EPA and DHA (which is where fish get theirs), and there are vegan supplements that are made from algae sources. Take a look at my guide to the best vegan omega 3 supplements if you’re interested in supplementing. One important note is that ALA converts to the more useful omega 3s (DHA and EPA) pretty poorly – around 10%. So aiming for the high side isn’t a bad idea. One thing to keep in mind is that nuts in particular also have a lot of omega 6s, so I’d recommend trying to fit as much of the other options (chia seeds, hemp seeds, beans, etc.) into your diet as possible. Beans and other legumes also have a lot of protein. Here’s a look at the amino acid profile of beans. Most foods and data above came from Self Nutrition Data. All foods and data came from Self Nutrition Data. 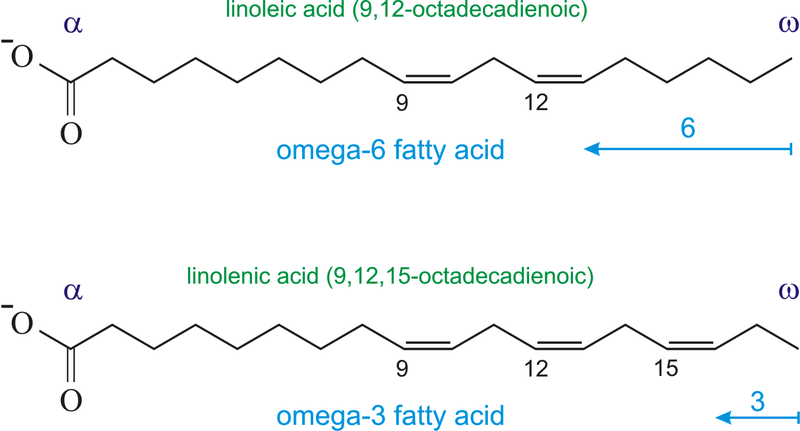 Omega 9 fats are important for health, but the body can manufacture them from other fatty acids. I still think it’s useful knowing which foods have omega 9s in them, but unfortunately no major provider of nutritional information provides data on omega 9s. Most people just don’t care about them too much. So you can see that it’s not too difficult to get, I just can’t find data that has the specific amount of omega 9 in each foods. I will update this page if it ever becomes available. Remember that it’s all about the ratio between omega 3s and 6s. Obviously the ratio doesn’t mean everything, since you probably don’t want to eat 10 cups of spinach a day. But it does tell you the best foods in general to try to regularly fit into your diet to get a good balance of omega 3 and 6 fatty acids. Don’t we want more omega 3s relative to omega 6s? The ratio chart near the end show that omega 3 intake should be higher. So the ratio of 1:1 is the high end (the ideal ratio), but that’s pretty hard to achieve. The literature says that anything better than a 1:4 ratio (so 1 gram of Omega 3: 4 grams of Omega 6) is good to aim for. If you can get the ideal 1:1 ratio, that’s awesome. So the chart at the end shows the ratio of omega 3s to 6s. The higher this is the better. Any ratio here of 0.25 or higher is equivalent to a 1:4 ratio or better. Why Am I Gaining Weight on a Vegan Diet?